Contemporary pellet stove offers both style and substance. With the cost of energy representing an ever larger chunk of the average American household’s budget, many homeowners continue to seek alternative ways of heating their homes. Increasingly, homeowners have been turning to pellet stoves as a supplemental (or, in some cases, primary) heat source. Pellets are made from various bio-mass wastes. Pellet stoves look similar to wood stoves or fireplace inserts, but the similarity ends there. Inside, they are quite sophisticated combustion appliances, and the result of their efficiency is low-cost heating. Unlike wood stoves, they don’t burn wood. 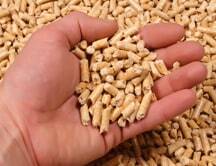 Instead, they burn small pellets typically made from recycled wood shavings, sawdust, or corn. The pellets that a pellet stove burns are actually recycled sawdust, wood shavings, corn, walnut and peanut shells, and similar bio-mass wastes that are ground up, compressed, and extruded. The 3/8-to-1-inch-long pellets look like rabbit feed and are typically sold in 40-pound bags. Pellets turn wastes that would otherwise be dumped at landfills into energy, lessening our dependence on oil. Both because of the fuel’s consistency and the stove’s combustion mechanics, pellets burn very hot. This means they burn more efficiently and more cleanly than wood—putting far fewer particulates into the air. Intense compression squeezes the moisture out of the pellets, dropping their moisture content to below 8 percent, which is very dry compared with cord wood, which has from 20 percent to 30 percent moisture. The drier the fuel, the more heat it can produce. And the hotter the fire burns, the more fuel it can consume. Compared with EPA-certified wood stoves, which give off about 5 grams of particulates per hour, pellet stoves give off less than 1 gram per hour. Pellets also create much less ash than cord wood and produce far less creosote, a common wood stove and fireplace hazard that blackens glass doors and collects in chimneys, potentially causing chimney fires. 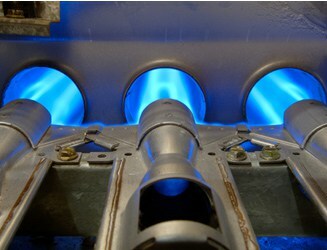 Combustion efficiency is a measure of how much of a fuel is converted to energy by an appliance. Pellet stoves offer 75 percent to 90 percent overall efficiency (be sure to look for “overall efficiency” ratings when comparing makes). In fact, so much heat is extracted that most pellet stoves may be vented horizontally out through a wall instead of through a conventional chimney (see How a Pellet Stove Works). Most pellet stoves produce a small fire that, concentrated in the center of the unit, burns very hot. If you like the look of a fire, try to find a unit with a good flame pattern and a large viewing glass. You can get ceramic logs that help disperse the flames and give the fire a more traditional look. Pellet stoves have an internal hopper for storing a day’s worth of pellets; depending upon the size of the stove, they may store from 35 to 130 pounds of pellets. Obviously, the larger the bin in stoves of similar output, the less often they require refilling. Inside, stoves are either bottom- or top-fed. 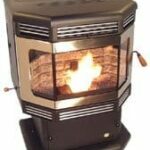 When choosing between a bottom- or top-fed pellet stove, consider the benefits and drawbacks of each. 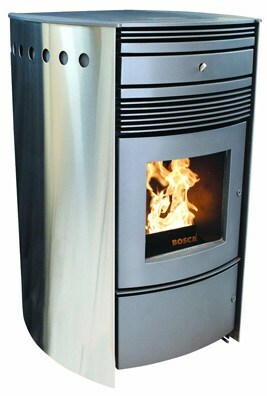 A top-fed pellet stove has a lesser chance of fire burning back into the hopper because of its pellet delivery system. But the combustion chamber is more likely to become impeded with ash and clinkers (the deposits caused by reheating ash). As a result, many manufacturers of top-fed models recommend burning high-grade, low-ash pellets. Bottom-fed models don’t require premium fuel because the ash and clinkers are pushed into the ash pan. But, with steady use, you will have to remove the ashes about once a week. An easy-to-use, large-capacity ash access drawer makes cleanup easier. The motors of most pellet stoves, of course, require electricity (some models have battery backup units), so the stove should be positioned near a 110-volt outlet. If you live where there isn’t any electrical power or power outages are frequent, buy a pellet stove with a battery backup, a non-electric pellet stove, or have a gas-powered generator on hand (see Buying an Emergency Portable Generator). 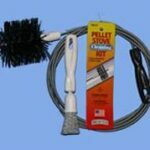 This and related installation issues are discussed in the article How to Install a Pellet Stove. Manufacturers produces both freestanding stoves and fireplace inserts in a variety of styles. Some manufacturers also make pellet-fueled furnaces and boilers that will take the place of, or supplement, conventional forced-air heating systems. Pellet stoves are measured in heat output range, also called heating capacity. Most have a rating of 8,000 to 90,000 BTUs (British Thermal Units) per hour. 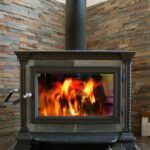 To choose the right-size pellet stove, it helps to work with a knowledgeable dealer who can take into account the many variables that will determine the best choice for you. Because pellet stoves are quite sophisticated, they’re not cheap…but when used for an extended period of time, they can earn back their cost in energy savings. For a complete discussion of this, please see Pellet Stoves: Costs & Savings. Though the physical size of a stove may be a consideration if you have limited space in which to put it, the primary issue is the heat output. If a pellet stove’s heat output is too little, it won’t warm a space sufficiently. If its output is too high, it can make a space uncomfortably warm. 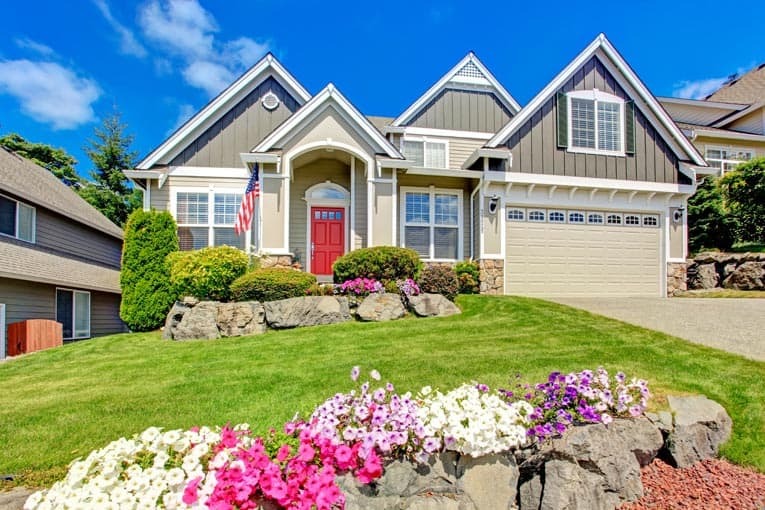 If it makes the area too warm, homeowners typically burn a smaller, smoldering fire, which is highly inefficient and causes undue pollution. When comparing BTU output among various stoves, be sure you are clear about each unit’s overall efficiency—that is, how much heat it delivers to the room (not including the heat that goes out the chimney). But many other variables come into play. These include the stove’s location, how open your home’s rooms are to one another, whether a blower or other form of heated air distribution is available, how well your home is insulated, whether the stove will be providing primary or supplementary heat, and so forth. When meeting with a dealer, be prepared to discuss these issues. According to the U.S. Department of Energy, a helpful rule-of-thumb is this: A stove rated at 60,000 BTUs can heat an open-plan, 2,000-square-foot home. A stove rated at 42,000 BTUs can heat an open-plan, 1,300-square-foot space.